Wound Healing and Drug Delivery Innovations. The company, nanoDERM Sciences, Inc. (nDS), is an early stage therapeutic products developer and Institute for Life Science Entrepreneurship (ILSE) member with laboratories in Union, NJ. The company, founder and CEO, Roy Yeoman, leads the nDS R&D team which is dedicated to the discovery, research, development, and commercialization of innovative drug delivery, advanced wound healing, and infectious disease therapy products. The focus of the nDS R&D plan is to protect, expand, and develop the patented drug delivery platform for large commercial markets of high priority medical needs. The core technology of nDS is HydroDEX™, a new patented copolymer molecule with broad commercial opportunity. This invention was a result of the continuing efforts of the nDS R&D staff to develop a high capacity, Non-Toxic, Biocompatible, Thermal-Responsive, and Biodegradable Hydrogel initially for use as the drug delivery system in the proprietary nDS wound healing dressing. Synthesized from FDA approved Dextran and another FDA approved polymer, HydroDEX™, should serve as a safe, universal standard in controlled nanoparticle Drug Delivery. Combined markets in need of the nDS drug delivery device, with tunable, “controlled-release” and “degradation” drug delivery features are in excess of $250 Billion as defined by a Translation Medicine Study. By invitation, and abstract award, nDS presented its novel technology at the 2012 Drug Delivery Partnerships Meeting, Las Vegas, NV. Medical Unmet Needs can be solved with the HydroDEX™ drug delivery nanotechnology. The 10th Award of the “Joint Technology Transfer Initiative” Program was won by nDS for novel antibacterial nanomedicine to combat burn wound infections of Drug-Resistant Bacteria. 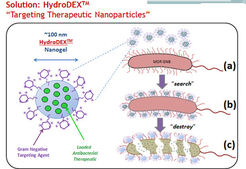 This one year Proof of Concept R&D grant, funded by the Department of Homeland Security supported the successful development of HydroDEX™ and in vitro testing that proves that the nDS nanotechnology successfully “targets and safely kills DRB pathogens.“ Combating infections of Drug-Resistant Bacteria (DRB) is a national priority as these infections add an expense of $20-35 billion to the US healthcare system alone. The nDS commercialization strategy is to focus, initially, on the development of HydroDEX™ for bacterial targeting/therapy to control DRB pathogens. 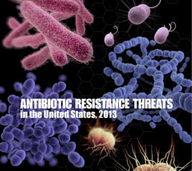 Based on the need to control infections of DRB globally, in particular within high risk patient populations in the US military, the nDS R&D team won a 2015 Defense Health Program (DHP) SBIR Phase I feasibility contract that delivered a working antibacterial prototype to combat infections caused by DRB pathogens. An nDS 5 year DHP contract has successfully delivered HydroDEX™ Proof of Concept Data for in vitro antibacterial activity against multidrug resistant bacteria. The nDS vision is to become the market leader in the $100 billion Infectious Disease Market and license it’s IP to the rapidly growing Targeted Drug Delivery (TDD) Market. Our focus is to produce antibacterial nanomedicine to combat Burn Wound Sepsis, the most common and serious complication of major burn injury, accounting for over 60% of deaths in burn patients today. Sepsis (which affects about 750,000 US patients each year, killing one person every 2.5 minutes) is mostly caused by “bacterial infections” which can be treated with our patented therapy. High profits are assured for the nDS investor supporting company efforts to fulfill this high priority unmet therapeutic need. The company ownership seeks partners to accelerate the commercialization of our patented therapy to combat multidrug resistant pathogens, bacteremia, and treat sepsis victims. Roy Yeoman at ryeoman@nanodermsciences.com, phone: 703-994-5856. Identify large health care markets of high priority “unmet” needs and develop safe, effective, life-saving therapy for patients worldwide.